This Is Why Growing Numbers of Pot Smokers Eat Mango Before Lighting Up..
Summary: The chemical compounds that have been found within mangoes have been discovered by science to be able to increase, strengthen, and even lengthen the euphoric feelings felt after smoking marijuana. This is great news for the marijuana community for both recreational smokers and medicinal smokers as they both now have a healthy alternative snack to turn towards during their munchies. Lately it seems that both the science community and the marijuana community have been falling into the same category. This is great news for both medical marijuana patients and recreational marijuana smokers alike! Of course it’s common knowledge that medical marijuana does exist and that it is a great natural remedy for aches, pains, and various ailments. And of course recreational marijuana smokers do enjoy the euphoric feelings of the herbal supplement as opposed to the feelings of intoxication caused by alcohol or liquor. So naturally marijuana is a safe alternative to most sinful pleasures as it is a perfect organic solution to the stresses and pains of life. So here is a little secret that the science community has recently discovered for the marijuana community: Eating fresh mangoes or even drinking a fresh mango smoothie one hour prior to smoking will dramatically increase the euphoric feelings felt by marijuana and help medical marijuana patients to ease their pain even more so. This is because a chemical compound known as myrcene terpenes, which is most often used for fragrances, can be found within cannabis and marijuana as well as many other various plants such as lemon grass, hops, and of course mangoes. This is why these types of plants are of such rare and unique types of odors and aromas. Once ingested the chemical compound, or myrcene terpenes, assists the psychoactive substance THC by allowing it to pass through the Blood Brain Barrier (BBB) at much faster speeds with much more efficiency. The time it takes for the THC to have an effect on the brain after inhalation is roughly seven seconds however, by eating a mango up to one hour prior to smoking the time it takes for THC to reach the brain and have an effect could be cut in half. As well as the length of the high and its time duration could be up to twice as long. Individuals who have eaten a mango, digested it, and then smoked have also noted that the euphoric feelings felt by marijuana are alarmingly much more intense. This is perfect for medical marijuana patients who would like an increased amount of pain relief or for recreational marijuana smokers who just want to get even higher than before. It is important to also note the different speeds in metabolism for those who are attempting to try this experiment. This is because individuals who have faster metabolisms may need to ingest a bit more than those who do not have as fast of a metabolism as well as individuals with slower metabolisms may need to ingest a mango or mango smoothie up to an hour and a half prior to smoking. This will help ensure that the myrcene terpenes found within mangoes have been properly digested and will have an effect. 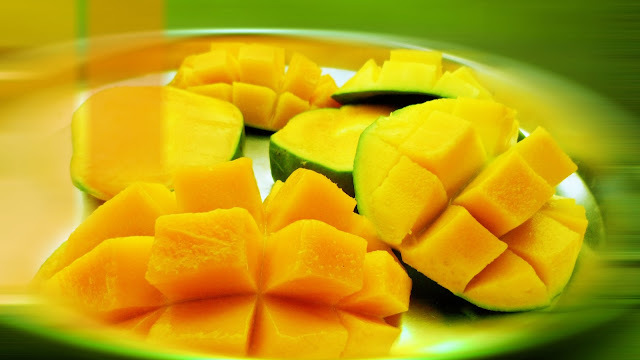 What else is great about this interesting scientific fact is eating mangoes is another great way for the human body to receive additional amounts of vitamins and nutrition and it helps individuals avoid eating foods that are high in cholesterol or trans fats. Eating too many fatty foods when the ‘munchies’ occur can be harmful and even detrimental to an individual’s health. So be sure to stay healthy and to eat healthy whether smoking marijuana recreationally or medicinally.